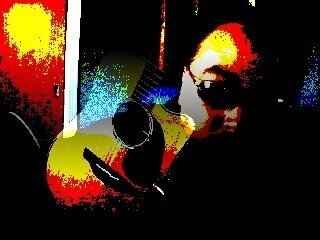 On 02/05/2013 Guitarhacker posted the song "Song With Imogen". I replied: "One of the most beautiful songs I have heard here. Great vocals and harmonies together with a perfect background. This was not the last time I listened." Now I found out about the background. and I wanted to create one of my own. The back of your hands, no good to you now. It's all shaped wrong when it should be rolling. You're pining every trick this box hasn't got. 'cause I know you're up to it. under sunset covers while the city lights up. whoever, whatever you need, it'll be here. The background to the song was explained in one of Imogen's vBlogs. She was asked to write a song for a TV film. The story was that a child (not sure if it was a boy or a girl) had moved from the country to the city (New York), and was anxious about going to a new school, and losing all their old friends. The song is written from the point of view of the child's mother trying to encourage the child to face the new life, make new friends, and so on. This helps make sense of the lyrics, e.g. 'don't give me that look... 'cause I know you're up to it'. Also the reference to Manhattan, since the film is set in New York. Of course in the end the song was not used for the film, hence 'The Song That Never Was'. Imogen posted the vocal stems to this track and invited her fans to remix it. Imogen did not provide any information about what key it was in, or how she approached the track. So I had to find some appropriate chordprogression (most of the examples on Soundcloud were not appropriate, some even tweaked the original melody) and find some suitable RealTracks. BiaB and Realband did the rest for me. This is SO interesting. More comments later... didn't want it lost.. I followed your advice and edited the link. I'm curious about your comments. So true, specially for a disenfranchised Teenager to become human once more. Great mix and the vocal is really well sung - such a pity that it didnt make the Cut. I think you have an inspired choice of RTs there - they work well together. Maybe more later - of gigging tonight. Your musical sensibilities flow so easily in different directions! This is unlike anything else I've heard you do, but you manage to keep your usual rock-solid quality in place even when you experiment! Not many people can pull that off! I admire the open-minded thinking of Imogen to propose such an interesting project to the world at large! I'm busy today, but at some point I'm sure I'll want to explore the other submissions. But what YOU have done with this melody is (to my ears, at least) a musically appropriate and very well executed accompaniment! The very stylish vocals and lyrics of course are center stage... but the sum total of all the song's elements make one of the most compelling pieces I've heard in a while! Your backing track fits her presentation like a custom-fitted glove! thank you so much for your nice reply. And thanks for your favourable remarks. "I'm sure I'll want to explore the other submissions." I only need three bars and get on to the next one. Guenter, that is wonderful. We ran into her singing with Jeff Beck on a DVD and were mesmerized. You did an incredible job with her vocal. I've read and reread the lyrics and like Gruve said you captured the whole feel of the words and the voice with your arrangement. Outstanding!! As usual you have mastered everything. Brilliant feel, mix, fills, balance, all captivating your audience in a sensational production. I'm going back for a 3rd listen right now. I've listened at least a dozen times - thanks for having the download there - it is nice to be able to play it on the good speakers and using the headphones. You created a terrific soundscape for the vocal to nestle in to. The drums are excellent - the combination of the RealDrums is very effective - and fit with the vocal perfectly. The bass and e. piano support it and never get it the way. The VERY start of the first note is a tad abrupt. I thought the sax intro should have been a little less busy - a few sustained notes in there (including the last one into the vocal - a fading note there would be nice). The sax leading into and accompanying the "Just one place" section has those kinds of held notes - it's really sweet. These are small things - not to detract from the beautiful arrangement. I probably left some things out.... Excellent work, Guenter. I first heard her, as did Janice and Bud, singing with Jeff Beck. And now this.Everything about that song is tremendous. I really, really enjoyed it. before you took it on ? Yeah this was a fun project and a nice thing for Imogen to do. I recalled listening to many of the nearly 500 different versions, most of which tried to emulate her electronica style.... as you heard, I and a few others went in a totally different direction with the music. She was supposed to pick her 10 favorite remixes and well.... I don't think that ever happened. I still have my version on my sound click and on my mp3 player and listen to it on a regular basis. I renamed it since I thought the name IH gave it didn't do it justice..... I called it "I know you're up to it" ... that just seems to fit the groove better. I like the smooth jazz style you used on this tune. I thought the jazz styles fit this song very well. I could write you all seperate thanks as some people here do (to increase the number of replies?). But I'll stick to the usual way and thank you all for your kind comments. @Dani: No, she just published the melody. Stunning! Loved it. I would also be interested to hear some of the other versions. Are they generally published on Sound Cloud? I did a search for "The song that never was by Imogen Heap"and quite a bit of stuff came up. Such an interesting project. This is simply wonderful! love the arrangement and the instrument choices were perfect. This is a great listen ... love the Jazzy feel. Still humming it. You did a great job...congrats on this marvelous piece! Nice work Guenter! I do love her voice. Great idea on her part to get people involved and increase her exposure and fan base.